Recently I received a new box of books from First Second Books. 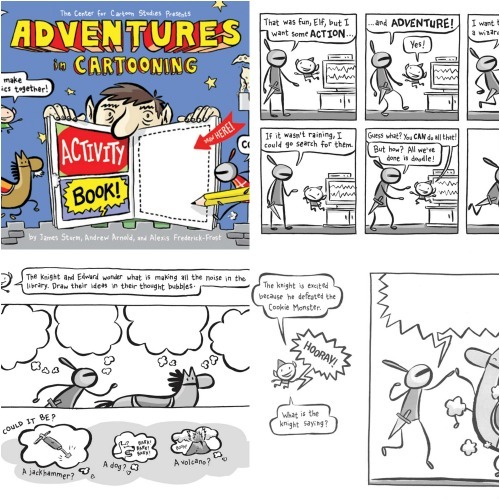 All four books are part of the Adventures in Cartooning series. If you have kids who are not yet sure they love to read, or who have been turned away from reading for some reason, graphic novels and comics might be just the thing to remove that blockage for them. 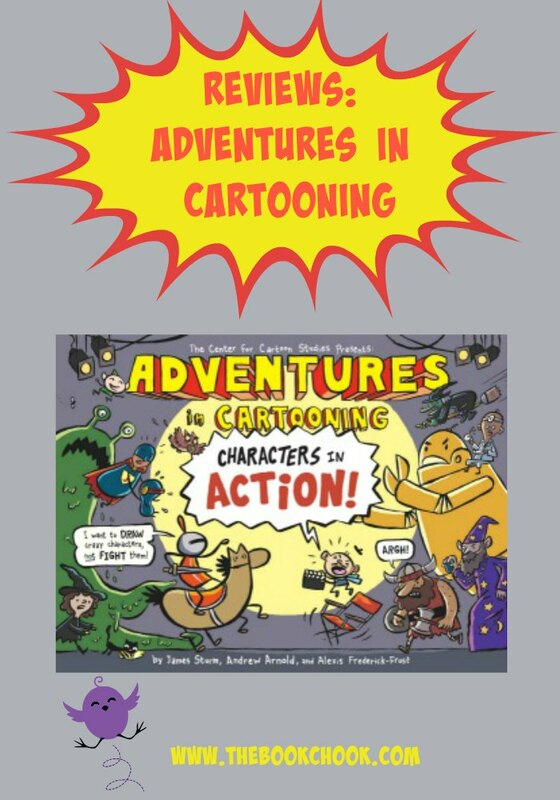 These books are entertaining, fun to read and share with friends, and promote creativity in young readers. 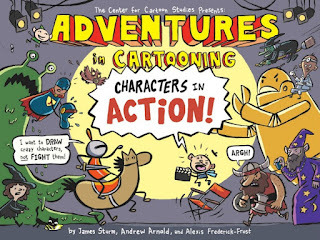 From the publisher: The superlative Adventures in Cartooning (2009) was a first-rate adventure story and clever comics primer for young readers. This follow-up offers a hands-on approach to creating sequential narrative that kids interested in the form will not be able to resist. Slimmer and lighter on story, the narrative of a knight and his friendly elf questing for fun in the middle of a rainstorm is seamlessly woven into various activities meant to sharpen children's understanding of and skill with the rudiments of sequential art. All the crucial bases are covered: illustrating expressions, characters, objects, and actions; using codes (like speed lines), perspective, dialogue, and sound effects; and panel sequencing and efficiency. This is a black and white activity book, one that cleverly incorporates a story with invitations to create our own part of a drawing. I wish it came with permission granted to teachers for photocopying a class set of a page for students. The temptation for kids to draw inside if it becomes a library book will be huge! If I had a small group of reluctant readers, I would love to use this book with them - reading along until it came to the drawing part when I would invite each student to create his own response to the instructions. 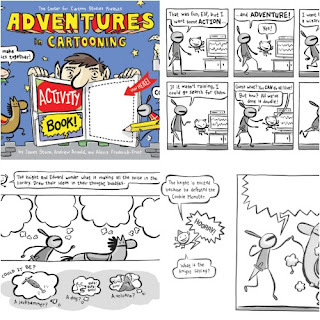 At the end of the book, children will find templates for creating their own adventure in cartooning. From the publisher: The Knight, Edward the chubby horse, and of course the Magic Cartooning Elf are back for more fun, but this time they're sharing the stage with a host of new characters. I loved the way the creators so obviously understand a child’s sense of humour. There are many laugh-aloud moments, as well as things to make kids grin and jab each other in the ribs. 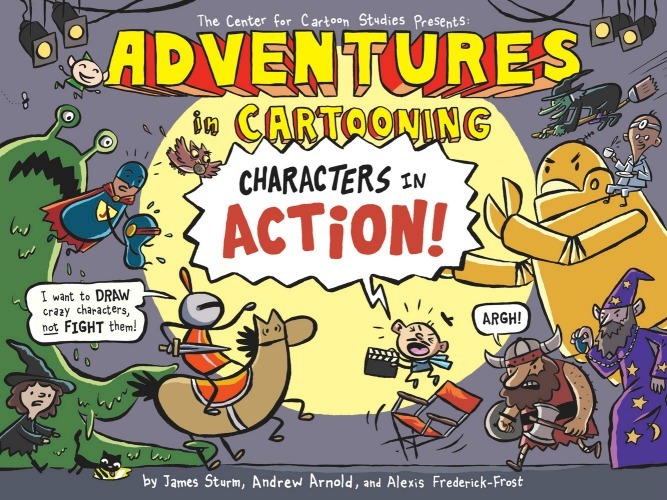 While we can laugh at the antics of the young Knight and her trusty steed, Edward, ultimately we want them to save the day and that’s what they do in Adventures in Cartooning: Characters in Action. Along the way, kids will pick up lots about communication generally, and cartooning in particular. From the publisher: The Knight can't wait for her first camping trip! She and her horse Edward pack everything they need--including her beloved Teddy--and head out into the woods. But when it's time for bed, Teddy is nowhere to be found! A helpful rabbit thinks this "Teddy" sounds familiar, and sends the Knight off to a cave... but that's no teddy bear in that cave. That's a real bear! This is a picture book/graphic novel hybrid for younger readers. The text is minimal and simple, probably suitable for kids from around Grade 2 onwards. Humour is obvious, almost slapstick - but that doesn’t mean older kids like me won’t be guffawing too! I loved that the full colour art work was correspondingly simple and clear, making Sleepless Knight a perfect introduction to graphic novels and the Adventures in Cartooning universe. From the publisher: The Knight's best friend is her horse, Edward. They go everywhere together and do everything together! But when the Knight gets a gryphon, suddenly all she talks about is how awesome her new pet is. Edward can't help it--he's jealous! 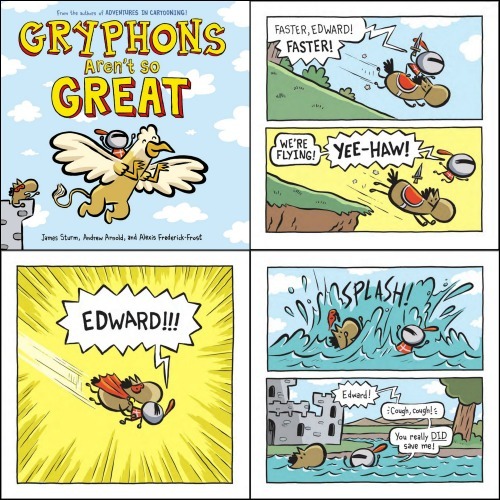 But the gryphon turns out to be more of a peril than a pet, and it's Edward who comes to the rescue in the end. It turns out that gryphons aren't so great...but Edward sure is! This is the second picture book set in the Adventures in Cartooning universe. 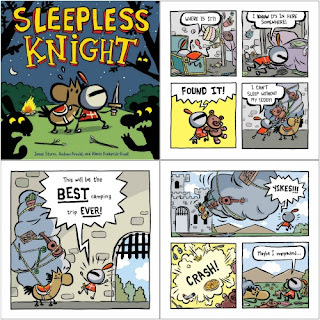 As with Sleepless Knight, my take on it is that it’s a picture book/graphic novel hybrid. This means it has elements of both formats, making the book a sure winner for younger kids. Again the creators have tuned into what children this age will find both hilarious and exciting. Great use is made of simple coloured panel backgrounds so that illustrations are easy to “read”, and text is minimal with large font. If you're interested in graphic resources, I have also reviewed First Second's Nursery Rhyme Comics, Fairy Tale Comics, Sleep Tight, Anna Banana!, The Zoo Box, Legends of Zita the Spacegirl and Return of Zita the Spacegirl. Find more book reviews at The Book Chook by clicking Reviews in the right sidebar.